A well-prepared rack of ribs is one of the best arguments for long, slow cooking methods. Whether braised in your slow cooker, slow-roasted in your oven or smoke-roasted over low coals in traditional barbecue fashion, ribs cook to a lush, tender richness. Unfortunately few cooks have that much time at their disposal on a regular basis, so it makes sense to prepare your baby back ribs in quantity and freeze them for later consumption. 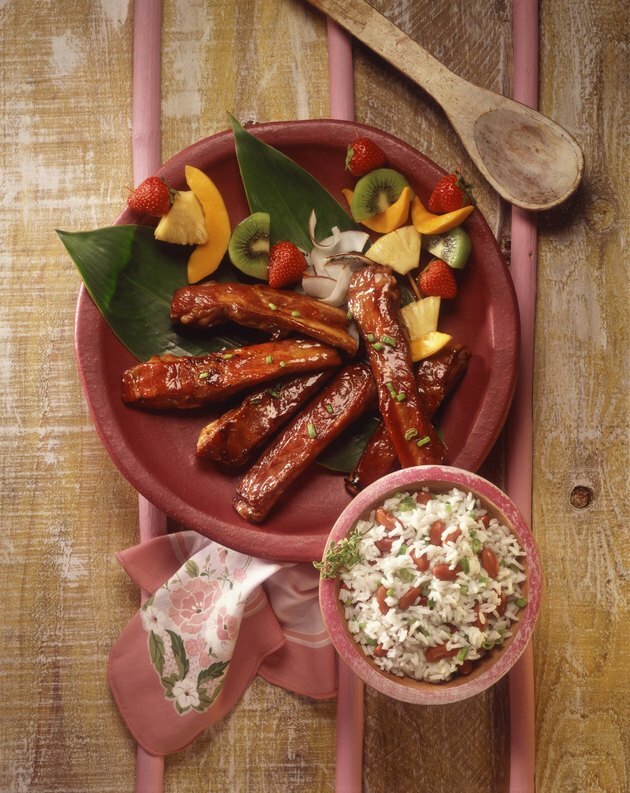 Ribs can be prepared in many ways. Barbecue-style is an obvious choice, but cookbooks and the Internet are filled with other alternatives. They could be simmered in teriyaki sauce, for example, or braised in soy and vinegar for a Philippine-style adobo. If you have a firm favorite recipe for your ribs, use that. Alternatively, prepare the ribs by slow-cooking them with just salt and pepper, or versatile flavoring ingredients such as onions and garlic. That keeps your options open when it's time to thaw the ribs for a meal. Your cooked ribs will need to cool before you can package them. The most efficient method is to place them on a wire cooling rack, over a sheet pan lined with aluminum foil. The wire rack allows air to circulate over the ribs, while the sheet pan catches any drips of sauce, fat or cooking juices. Once the ribs have cooled to room temperature they can be packaged immediately, or refrigerated until the timing is convenient. Once the ribs are cool, decide how you want to portion them. A full rack is awkward to freeze, but makes a more impressive appearance at the table. For most people, 1/2 to 1/3 of a rack is a perfectly reasonable portion. Cut between the bones to portion each rack into a size you consider appropriate. Lay each rib portion on a large sheet of plastic film wrap. Wrap the ribs tightly, squeezing out as much air as possible. Place the wrapped portions inside a heavy-duty freezer bag for added protection. As food science writer Harold McGee explains, foods retain their texture best when they freeze rapidly. Ribs are naturally flat and will freeze quickly if you observe a few simple rules. Freeze the ribs in a single layer, if at all possible. It's often best to freeze the individual portions, then transfer the wrapped ribs to a heavy-duty zipper-seal bag once they're frozen. If you have several pounds of ribs to freeze, don't add them to the freezer all at once. Instead, refrigerate them and freeze a few pounds at a time over a 24-hour period.